I have always loved quiches, this is food I could eat all the time. Having said that I just don't make them often enough. I blame my husband as this is not his type of food. It is school holiday time, so lunch has become another creative outlet for me. My kids are hungry all of the time, it is ridiculous. And as they are growing they are not only eating more. they are loving food more. Watching them enjoy what I cook for them is quite exciting. 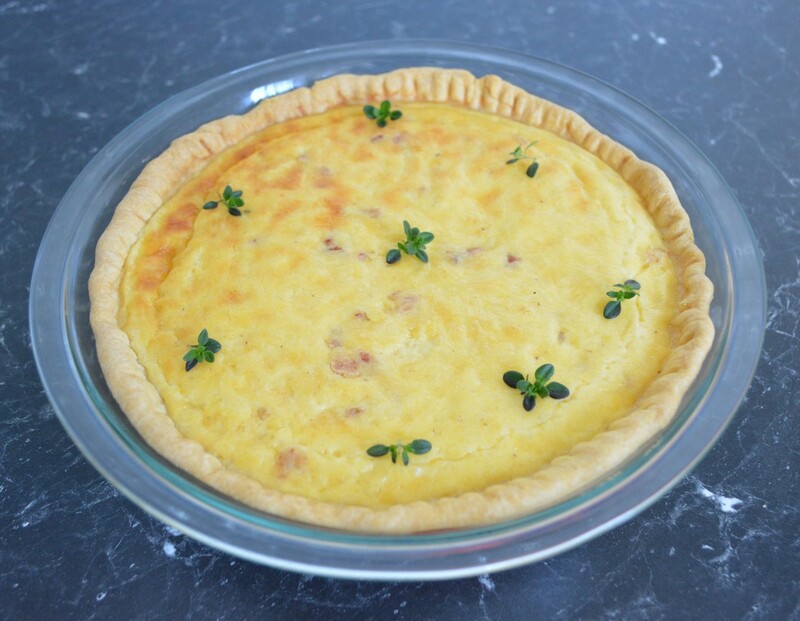 Quiche, I've had good ones, I've had bad ones, this one is AMAZING. The pastry is so nice, perfect actually. It is thin, it is crisp, it holds its shape, it is the perfect base for the filling. As for the filling it is not eggy, it is light, there is just enough bacon through it, it is just delicious. I did not have speck at home, but I had bacon, so I used bacon. It was brilliant, if I had speck at home I would have used it, both for me are interchangeable. But in the recipe I will put bacon, if you use speck get 1 x 100g piece speck, cut into 3cm x 1cm strips (lardons). 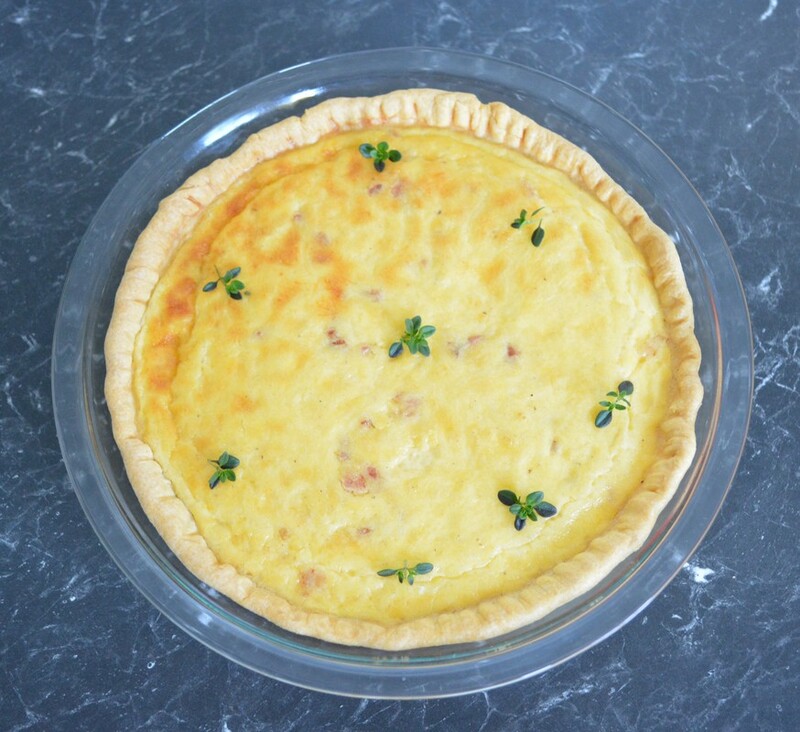 So if you have never tried making quiche, I suggest you should try this one. It is delicious. For the shortcrust pastry: Put the flour, salt and butter in a food processor and blitz until it is like coarse sand. Add the egg yolk and water and blitz until it comes together. Place the dough on a lightly floured surface and knead gently for a minute. Shape the dough into a disc and refrigerate for 30 minutes. Cut the pastry in half as you will only be using half of the pastry. Refrigerate the rest for another use. Roll out the pastry between two sheets of baking paper, make it big enough to line the base of a 20cm ceramic quiche dish or tart tin with removable base. (If you have not rolled very well you can cut bits where it is overhanging and press into any gaps you have, it sticks together well and keeps hold once baked). Using a sharp knife trim off any excess pastry. Refrigerate for 30 minutes. Scrunch up a piece of the baking paper you used for rolling. Open up the baking paper and place it on top of the pastry. Fill the paper with pastry weights, dried beans or rice, all the way to the edges. Blind bake for 15 minutes. Remove the paper and weights, then reduce the oven temperature to 180C and bake the pastry for another 5 minutes or until it is dry and light golden. Remove from the oven and leave to stand until cool. Meanwhile, heat the oil in a frying pan over medium heat. Add the bacon and cook, stirring often for 5 minutes or until golden. Drain on a paper towel. In a large mixing bowl add the egg, egg yolk, milk, cream, nutmeg, salt and pepper. Whisk to combine. Add the bacon and cheese and stir in with a spoon. Pour the mixture into the cooled pastry and bake for 20-25 minutes or until just set. Scatter over the thyme leaves, serve warm with a green salad.